Are you worried about your health? Thinking… if you are getting the complete nutrition you need for the perfect health? If you are then you might be going through lots of fruits & vegetables. But it is boring to have all these veggies & fruits, in the same way, every time. Now, you might be thinking if you could make all these boring food plans more interesting and tasty. Then guess what!!! You have found the easiest & healthy way make your boring food plan more interesting. Raise your health standards with the best-in-class Nutrition Extractor, the Nutribullet Rx blender. The 1700 watt / 2.3 HP motor with SMART technology beats the ordinary juicers and blenders in the market. It pulls out all the nutrition from the fruits & vegetables. So, from now, you will never want to go back to your older ways of eating. The motor is much powerful than ordinary ones. It’s very loud for the power of its motor. Easy to assemble. It does not support manual control settings. Can make hot soup with its SouperBlast Pitcher technology. Sometimes it makes drinks hot. It has Hands-free technology. It does not have lock mechanism. It can blend nuts, seeds, skins and everything with perfect smoothness. Have complaints of unexpected leaking. By reading “1700 watt motor” you can get an idea of how much power this blender has in it. It not only blends vegetables and fruits, but also extracts all the nutrition without any waste. The earlier versions of NutriBulllet had 600 watt & 900 Watt motor. But this 1700 watt blender is about double the power of the earlier ones. Which means blending, juicing or anything in your pantry is now double faster and easier. It give lots of blending opportunities which helps making many interesting & mind-blowing recipes. At least you don’t have to worry about your daily boring foods from now. 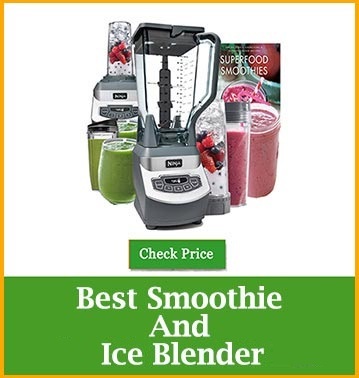 With such power it is indeed one of the best smoothie blenders you need to have. With larger motor, Nutribullet Rx blender also comes with larger cups. It includes a 45oz Oversized Cup and a 30oz Short Cup which brings out the amazing taste you’ve may missed before. Its Stay fresh lid fits both larger and smaller cups confirming a complete air-tight storage. A cool thing about the cups is, it’s completely portable. You can enjoy your smoothies and juice direct from the cup. You only need to open the blade lid and there you go. This makes larger batches of foods more manageable. The Nutribullet Program has brought another great thing to us. This new SMART hands-free technology elevates the problem of checking and guessing whether it has blended in proper way or not. No one likes chunks or lumps of vegetable & foods in the food, even me too. It a horrible feeling. The new hands-free technology operates the power, speed & time according to the type of food in the cup. Now you can enjoy the best ever smoothie by your own without any stress or worries. It comes with a feature which will complete the craving for soup at any time. It adds a new dimension to the machine. Most of the blenders are for blending and juicing (for further extent). But the 7-minute heating cycle feature turns your veggies & spices into a rich and tasty hot soup. You only need to plug the power base and turn on the power button at the left side of the power base. When the power button turns “Blue” it means it’s activated. Then place the Souperblast pitcher with the blade side down into the power base. This will activate the power base and the “G-button” will be lit Green indicating that it’s ready to start. Press the G-button for more than 2 seconds until it glows RED. When it glows RED, it means that the “Souperblast” mode has begun. You don’t have to mess up the whole kitchen preparing for soups from now. The Nutribullet Rx soups program is an “All in one” thing needed for making your hot soup. The new heat cycle also can sauces. It a life savvier for your diet and cheats meals. The new Nutribullet comes 2.3 HP High-Torque Power Base with hands-free technology for making most nutritious & smooth drinks and smoothies. The powerful Nutribullet Rx base is of 1700 watt motor. It makes fruits & vegetables better & more edible. It can also make boring fruits & vegetables into tasty and smoother drinks. It’s completely automatic. No manual inputs needed to use it. It comes with a compact 10 piece set which is very easy to assemble. The powerful twist-on blade fits in all cups, extracting whole fruits & vegetables into liquid. It takes around 30 seconds to get the smooth consistency on foods. Well, it also depends on the type of fruit & vegetables you add. It can blend seeds, stems, nuts, skins and almost everything better than you can expect. 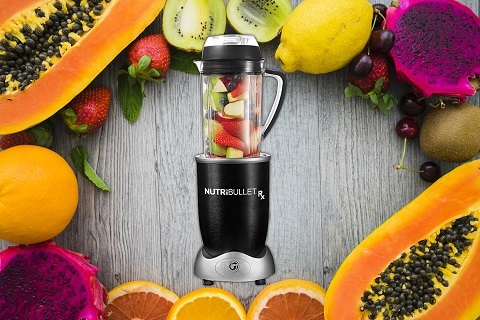 NutriBullet is a small, lightweight blender which is easy to store anywhere. It is also easy to assemble and clean. It’s not “a blender”. It can shred, chop, extract and grind too. The Nutribullet Rx blender has around 95% extraction ratio. So you actually can get the benefits of the food you’re eating. The 7-minute heat cycle makes vegetables, seeds & spices into fresh, hot, puréed soups, sauces, dips. The blade is easy to assemble and use. To fit and remove the blade assembly, there is a blade remover tool, making it more stress-less and easier. The free recipe book has over 150 pages of recipes. The User Guide provides all instructions & safety information for its use. It’s manufactured in compliance with US & Canadian Electrical Standards. It is not designed as a food processor. Cannot input manual timer and speed settings on this blender. It is one of the heating blender in the market, as it is so powerful. The SouperBlast Pitchers is not always air-tight. Make sure about it while using. The heat cycle feature makes the drinks hot. The rubber ring sometimes becomes loose during operation and can get cut by the blades. The frozen fruits don’t want to make their way to the blade. The screw-on blade extractor may sometimes become difficult to tighten and remove for others. The foods somewhat remain uneven because of the auto controllability of the machine. Being honest I would say that, the Nutribullet Rx blender is a powerful multitasking blender. It is perfect for those who want to and willing to start a healthy lifestyle by making tastier smoothies. It breaks the foods more quick and with better results. The new 7-minute heat cycle technology makes fresh hot soup in 7 minutes which is still not available in other blenders. The best thing about this blender is it can smash, grind, extract and blend anything you put in it. This makes it perfect for making smoother and fresh smoothies and soup every day. It’s also perfect for family-sized batches of smoothies or making items ahead of time. We got some news about the leakage and rubber coming out. It may happen if the users do not go through the user manual. It has description of how the blade can get adjusted by the removal tool. If you can understand the use of this blender according to the provided guide, then all the issues gets sorted. Best thing about the Nutribullet Rx accessories are you can easily find and get Nutribullet spare parts. The performance you receive from it compared to its price is quite reasonable. By comparing it with other major brands like Blendtec, Vitamix etc. you can know the differences. This may still be a good option if your main concern is convenience. Although, this machine is very easy to use and clean, and you can blend and even drink in that cup. It will save you some time and also you can store using the pitcher lid. 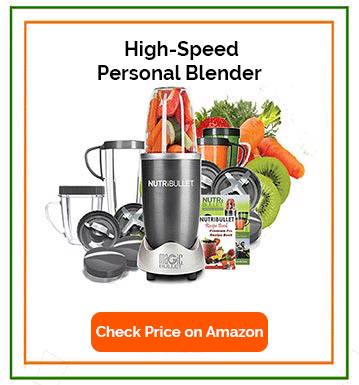 If you find the Nutribullet Rx reviews helpful & you want to check the latest deals for Nutribullet Rx Blender, then click on the button below.